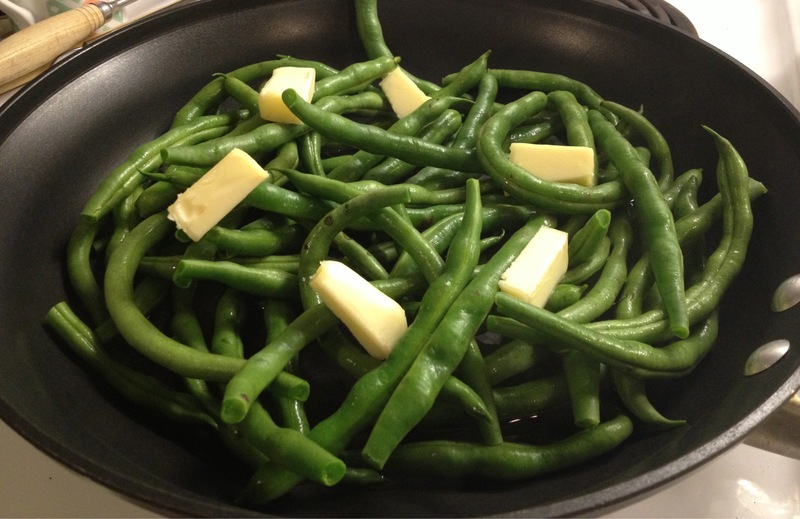 Delicious, skillet-cooked green bean recipe. 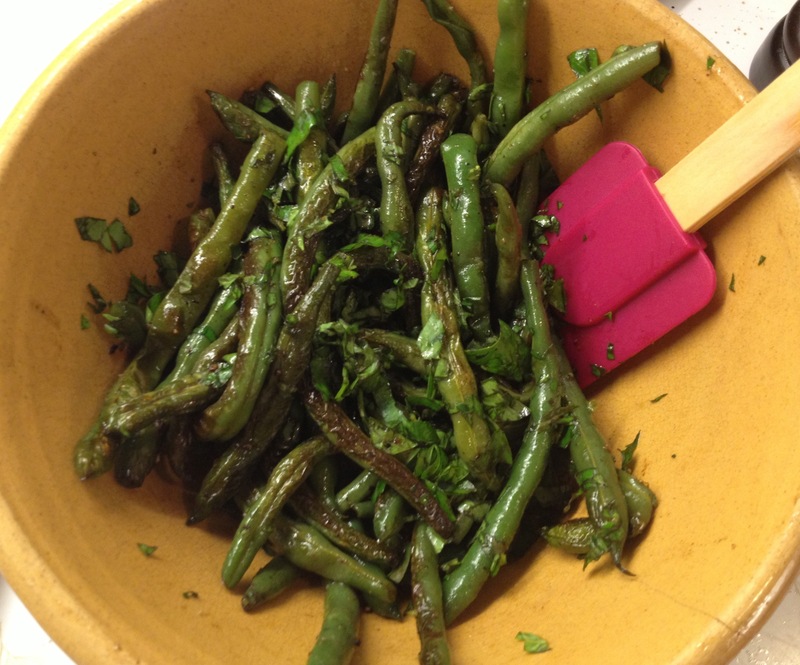 In addition to the terrific chicken we had last Friday and the leftovers for lunch this week, I would be remiss if I didn’t share this green bean recipe I made featuring Ethel and Tom’s glorious beans. Just look at these beauties, which we had with the chicken. I used my old trusty skillet method and then topped them with some chopped fresh basil from my garden at the end. They were so darn delicious!! 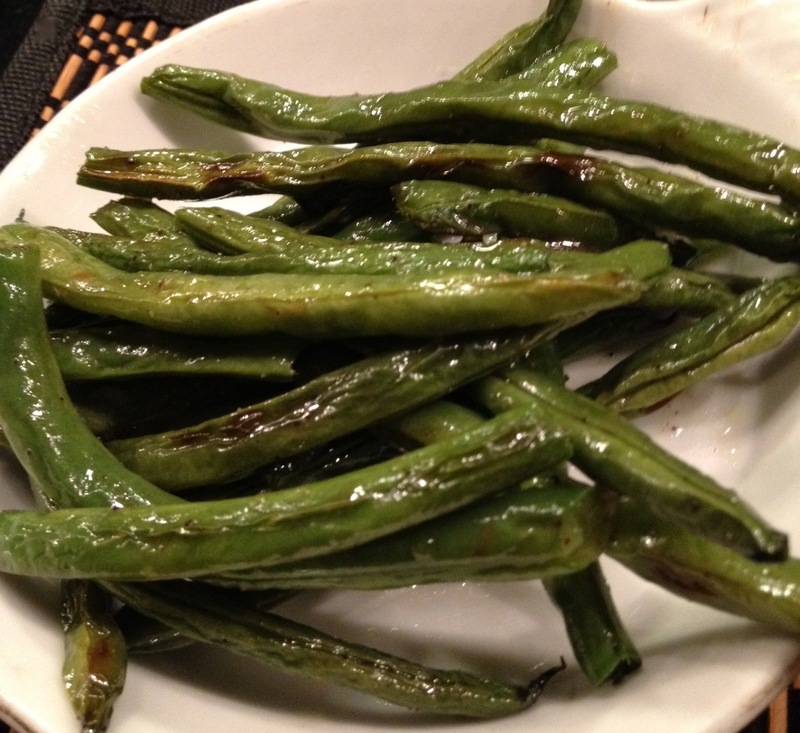 I highly recommend this green bean recipe when you want a healthy, beautiful, quick addition to your plate. I also took a carton of their frying peppers, washed and tossed half of them with a little olive oil, salt and pepper and Steve threw them on the grill. So very, very yummy. Then they had (literally, and yes they know the Fourth of July is over) red, white and blue potatoes to sell! Since my husband has been following the “4 Minute Abs” diet (ha! ), we are not eating anything white. So I bought the red potatoes. We could eat those!! So on to the contest. As you could have guessed by now, I did not win. But I so appreciate all of your votes and efforts!! Thank you so much! It’s a pain to do it every day, I know. 373 people entered and the winner got 4000 votes. I was in the top 35 with about 400 votes. 🙁 Perhaps next time! Our wonderful farmer friends, Ethel and Tom, once told me that all the local restaurants that they sell their vegetables to, always oven roast them as their method to cook. Ethel said they all swear that oven roasting brings out the natural sweetness in the most marvelous way. Now I’ve been a big fan of roasting eggplant, turnips, zucchini, mushrooms, cauliflower, carrots, asparagus, all kinds of squash, Brussel sprouts, peppers, and of course potatoes but green beans? So with my shrimp and pasta dinner the other night, being so tired and exhausted, and wanting to eat quickly, I decided to try it. They were delicious!!! Give it a go! Preheat your oven to 375 degrees. Make sure your beans are all dry – use a dish towel if you don’t have time to air dry them. Place in a pile in the center of a rimmed baking sheet and drizzle olive oil on and salt and pepper. Toss well and spread out all across the pan in a single layer. Roast for 20 – 25 minutes until tender. Toss once in the middle of cooking. Enjoy! This past week, we had some dear friends over for cocktails and appetizers and then had dinner together at the Red Rooster restaurant, just open a year now, but famed and always crowded. It’s nice! Charlie Rose was at the table next to ours, (poor guy, he spilled wine all over himself) and the star chef/owner Marcus Samuelsson stopped by and chatted with us. As usual, the Swedish meatballs and fried chicken (yardbird) were great! I’ve mentioned before, I don’t think I do appetizers well and this opportunity of only having to serve just that and not a whole dinner, was unusual for me. So I wanted to make them different, not too filling, (because I knew dinner would be), and fresh. I think I achieved that. 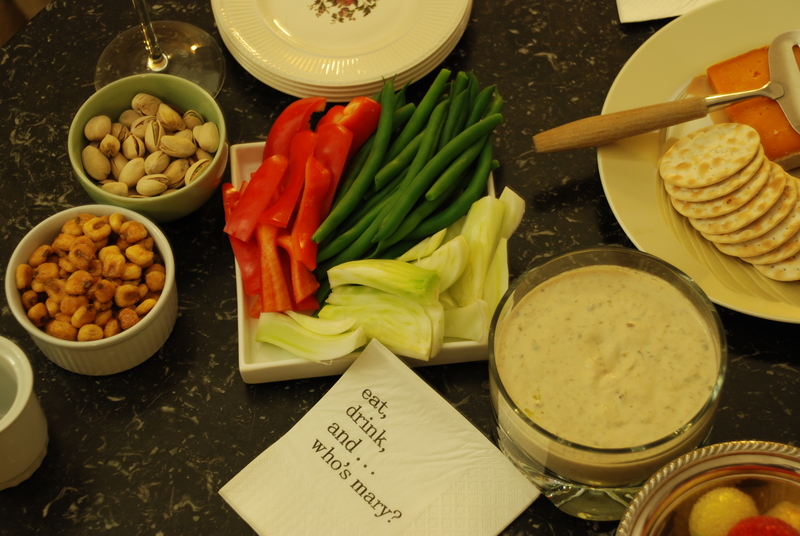 I relied on my friend Margaret’s recipe for tonnato, a really creamy, bursting with flavor dip. Combining tuna, anchovies, capers and mayo and you can’t go wrong. 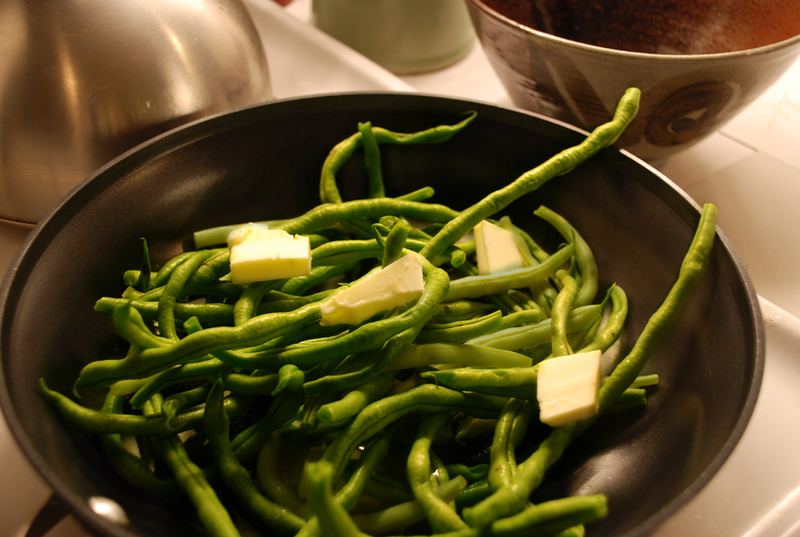 Throw in parboiled green beans, fresh fennel and red pepper sticks and you’ve got a delicious combo. I also included a marvelous true English cheddar from Todd English’s Food Court at the Plaza Hotel, some crackers, pistachios (Susan loves) and corn nuts. It worked out great and I think this would also be great for game watching today. Let me know what you think! Combine all ingredients in the food processor and process until smooth and voila, you’ve got one tasty dip! Do taste before you add any salt and pepper as you may not need any salt at all. 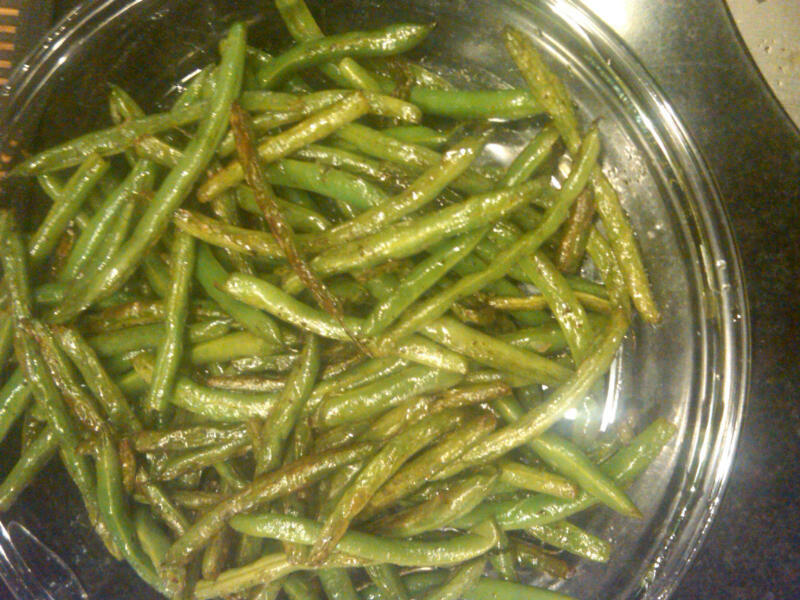 For the green beans, trim the one end, drop in boiling salted water for 2 minutes. Drain and immediately put in an ice water bath to stop the cooking. Pat dry and let air dry. When dry, wrap in a paper towel and place in a ziplock bag in the refrigerator to chill. Fennel and red pepper strips should just be raw. You could also use carrot, celery or cucumber strips too. 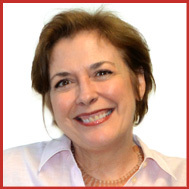 My friend Joannie asked for more easy vegetable recipes, so here you go! Trim ends of beans and wash thoroughly. Heat 3 TBS. water in a skillet on high heat. Throw in beans and then top with 4 large pats of unsalted butter. SEE PHOTO. Now let sit them a little to brown and then toss over the high heat. You want the beans to get a little brown yet still stay crisp fresh. So toss to your liking – taste one. The butter will start to brown and almost taste sweet. Finish with salt and pepper and serve with all the juices. Total time should be 10 -15 minutes. These will be gone before you know it! Just as good as French fries – really!